Observation - Raft Spider female - UK and Ireland. 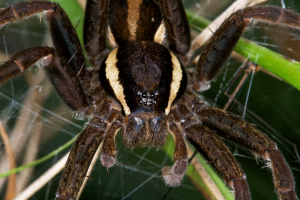 Description: Extreme macro of female Raft Spider taken with Canon 400D and 100 mm lens with ringlite. She was nesting at the time which allowed me to get a close as I possibly could. If you look at the full sized image you can even see her eyebrows - I'm not kidding!